We do not live in the country. In fact, we live in a typical neighborhood with sidewalks and a community pool and backyard trees to cover the neighbors yard parallel to our own. That's why I have been so surprised by the, um, wildlife assortment I've seen in the months we've lived here. First, it was the big opossum in our backyard running along the fence line at night. Then, it was the skunk I drove by one day, the deer in the fields on the main road, the mini SNAKE (yes, snake, not worm!) I found under my shoe in my closet the other day, and...most recently, another opossum. Well, actually two more opossums. A few night's ago, I heard our dog Scout barking in a way she never has before. I was thinking that it was just a squirrel or the neighbor's cat in a tree, so I let her back in and forgot about it. The next morning I went outside to that same corner and found a dead baby opossum! And yes, it was actually dead, not fake dead. As in...my dog killed it. And then again, last night on our walk, Scout found another opossum and tried to grab it around the neck with her mouth, before I saw it actually play dead, as opossum's tend to do. It did in fact look dead. We resumed our walk and when we went back by the same spot it was gone. YIKES. Basically now, I am living with this irrational fear of opossums in my neighborhood, but even worse, of my dog bringing dead ones to my front door. Oy. Send help. 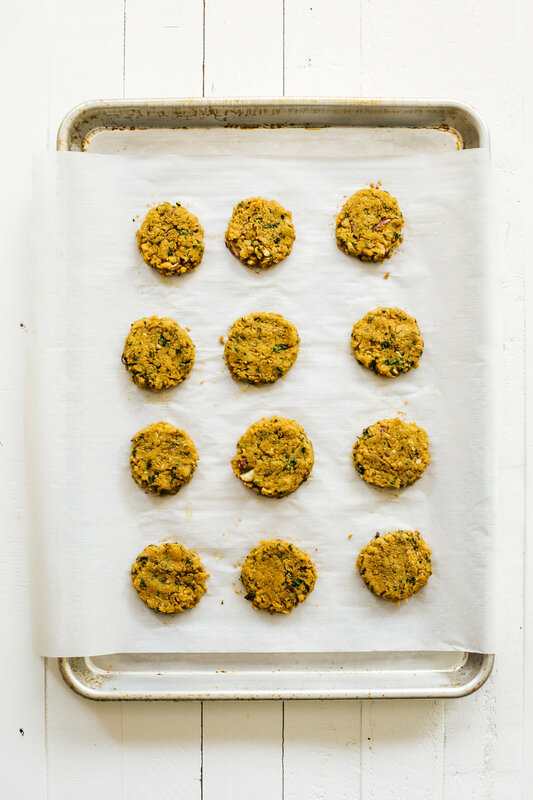 Let's just go ahead and talk about this baked falafel right now, k? In NYC (where there are no wild opossums that I know of), we would often get Halal food at a nearby food truck, a cold peach Snapple, and then find a bench or grassy hill in Central Park and have lunch. I would always get falafel and Kyle would always get the lamb gyro. Baked falafel is not the same as regular falafel (which is fried) but I try to make healthy choices when I can. These are so easy and are kind of similar to the process of making meatballs but are so much healthier and lighter. These would be great atop a salad, or as I did here in warm pita and tahini sauce. I just love them so! Pulse all ingredients together in food processor until mixed, but not puréed. Refrigerate for 15 - 30 min. Preheat oven to 375°F and line a large baking sheet with parchment paper. Roll chickpea mixture into 12 even sized balls, about 1-1/2 inches round, and arrange on the baking sheet. Flatten with a spatula or your hand into patties. Brush with olive oil and bake in the preheated oven for 10-15 min or until golden brown. 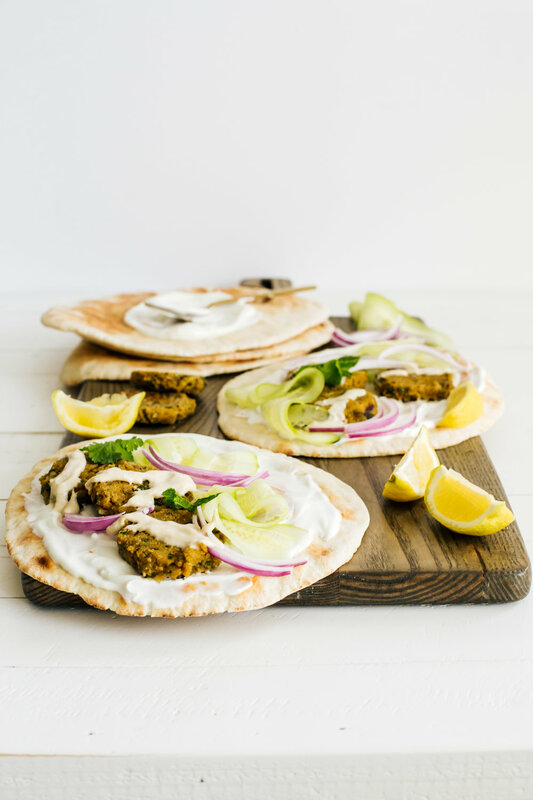 Smear some warm, fresh pita bread with a dollop of greek yogurt. 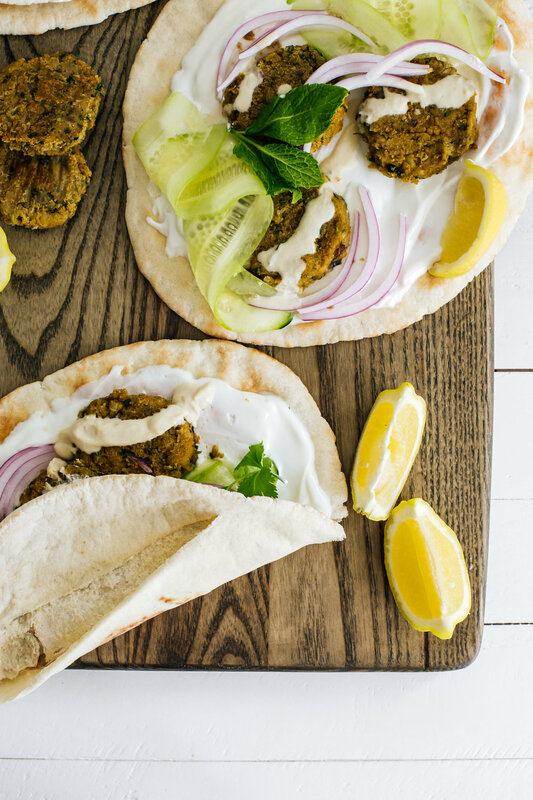 Add 2 - 3 baked falafel patties, cucumber, red onion, fresh mint or parsley, and a drizzle of tahini sauce. Serve immediately!